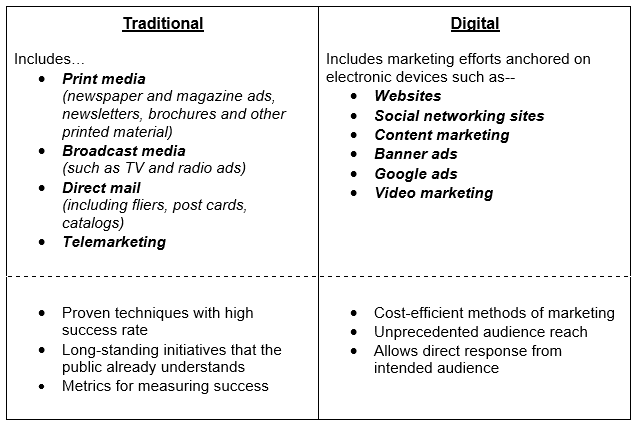 When it comes to marketing—is digital really the new traditional? What do you think? That’s a long-standing debate that has marketers on both fronts defending the merits of each. Does that mean that you need to do both? No—you need to do what is most effective for your business. Choosing the medium that is cheaper. Picking a strategy that has better reach. Using a platform that gives you tangible, almost direct, response. Digital marketing wins this one, hands down. Even stalwart traditional marketers know that they cannot compete the Internet’s potential to reach thousands with just a single post. 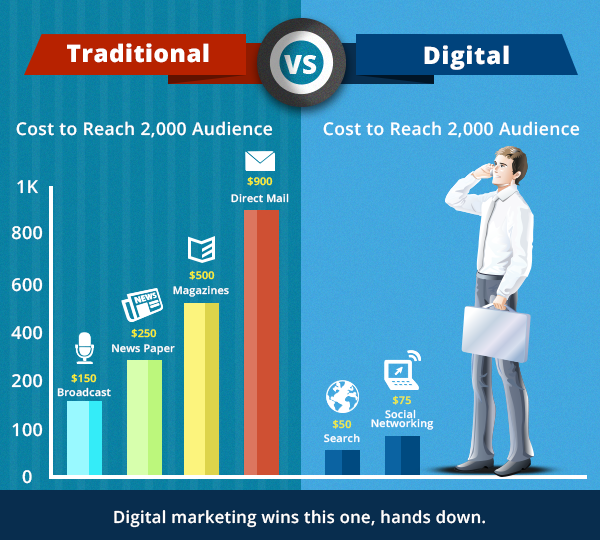 But don’t be too quick to dismiss what traditional media can do in support of your digital efforts! 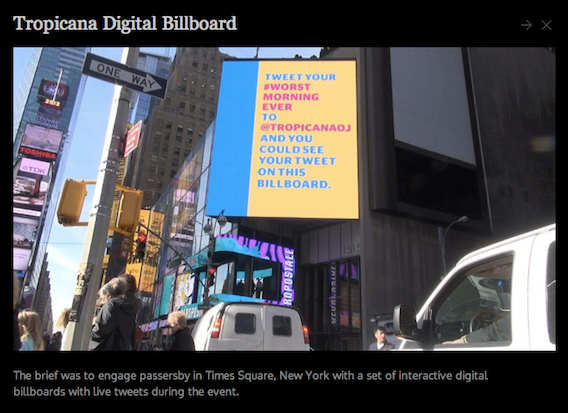 Printing something on a billboard or paying for some ad space on a newspaper with a call to action that pulls focus to your online initiatives can be a great way to expand exposure. Check out how Tropicana combined traditional and digital efforts in the photo below. Tracking your businesses customers and clients and knowing how they found you has been a question marketers have faced since the very beginning of advertising. Understanding which ads work the best and where to place those ads is one of the most important ways to increase your profits. 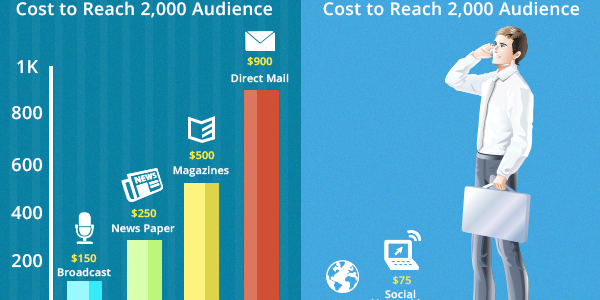 With traditional marketing, measuring the return on investment can be difficult. If you spend $500 per month on a billboard, you really have no way to know how many people saw the billboard or newspaper ad. You have no idea how many of those people purchased a product in your store. But, with online (digital) marketing, and the right tools, you know how many people saw your post, ad, or video, how many of those people visited your brand's website and if you sell online products, you can even see how many of those people purchased your product or booked your service. Count the people visiting your blog. Digital campaigns makes it easier to track and measure specific goals for your marketing efforts. This is in stark contrast to traditional marketing where it’s harder to track who actually switched to another channel when your commercial came on, who took the time to read your ad in the newspaper or how many actually opened the direct mail you sent them vs. how many were left unopened after you had sent them. To truly know which content brings you the most traffic, you can use our free traffic tracking tool. Digital platforms offer a way for your business to reach out and make that much needed connection more meaningful for your audience, and it’s up to how well you actually know them. Depending on who you want to speak to, you can tailor-fit your marketing efforts accordingly. For instance, if you want to reach out to Traditionalists (those born between the 1920s to the mid 1940s) and Baby Boomers (born in the late 1940s to mid 1960s), you might want to consider that these generations might appreciate a combination of digital and traditional efforts. How about doing something online as well as radio? On the other hand, if you want to speak to Millennials (those born in the 1980s to the 1990s) and members of Generation Z (those born in 2000 to today), it might be best to focus all your efforts on forms of media that they are most comfortable with such as video, blogs, email and mobile initiatives. The arrival of smartphones and the unprecedented accessibility it offers has reshaped the way audience consumes media. 4 our 5 mobile phone users use it to shop online. People will check their social networks on their smartphones rather than their desktops. 3 out of 5 mobile users pay attention to mobile ads while visiting social media sites. Mobile marketing ranks at the top in terms of media consumption with 1.8 hours, above TV (1.5 hours) and other platforms. They spend nearly 2 hours on their smartphone, daily. Fact is, mobile is now the leading medium around the world—and digital strategies can easily be a part of this growing platform. The goal is to reach consumers where they are, and right now, it’s through their mobiles. The beauty of digital marketing is that it gives businesses direct response for their efforts. And if you have a limited budget, getting these results can go a long way towards showing you that you’re doing something right for your product or brand. Take stock of all your online properties—do you have a website? A Facebook account? Linkedin? Twitter? YouTube? Consider something from traditional marketing that will complement your business—flyers or posters work well for small businesses. As part of the copy, add your website address o as your call to action. You should be able to see the difference in your site's metrics as more people go to your website or “like” your profile. 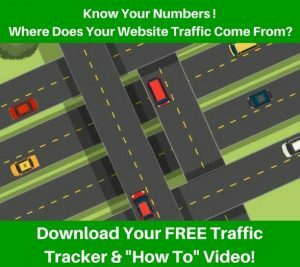 Use this free online traffic tracker and post content to your social media sites. You can now see which posts brings you the most traffic. 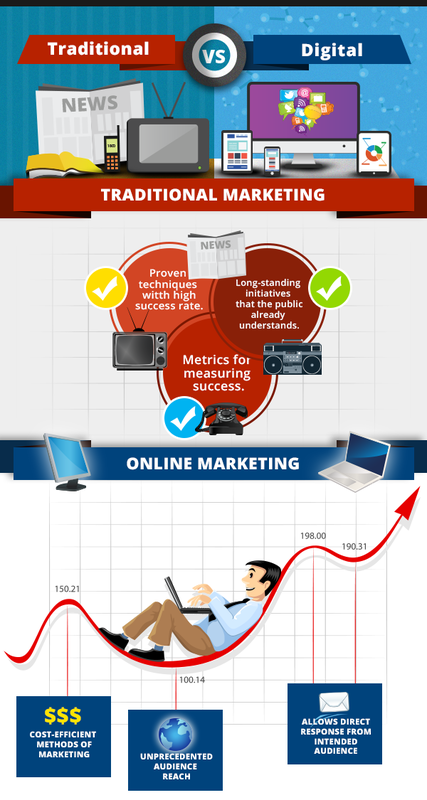 Now, you are know which method – traditional or online – works best for your audience. Be sure and measure over longer periods of time and continue to track your results.